We haven’t prodded the boys on earning their rockers. One of the primary principles of being an adult Boy Scout leader is to allow the boys to discover lessons themselves. Sure we’ll explain things (once), demonstrate things (once) and even guide the boys, but, ultimately, our job is to enable maturing young men to enjoy discerning their own paths to success. This is most especially true the older scouts like the ones who come to Jamboree. All our boys are all at least First Class and most of them are well beyond that. As we would have hoped, with just a few snippets of reminders here and there, about 66% of the boys have already earned all their rockers. Perhaps another 15% are within a good days work of also completing their rocker set. You might have expected the older boys to have been the first ones done. In which case, you might have been right. As you also might expect, the boys of the ever efficient Kactuz (not “Cactus” as I incorrectly spelled it in an earlier post) have earned the most (mind you, this is not the most senior patrol). The Skittles, on the other hand, have accumulated the most merit badges. The merit badge leader, however, resides in the Kactuz patrol (and he’s almost done with his rockers, too, but that was by accident, not by design). Early this morning (around 5:30am), 8 boys and a scoutmaster took the 45 minute hike up the road to get in line to see Shaun White, an Olympic gold-medalist in the mountain boarding competition. More boys would have gone, too, but they decided to sleep in. They arrive at 6:00am, four full hours before the Olympian arrives. There are about 200 people in front of them. Some of the boys have slept over at the site. It turns out they just make the cut-off and get their autographed photos. They also get to sit within a few rows of the star and get excellent pictures. All told, from the time they woke up at 5:30am, it took nearly seven hours for the boys to get the autographs. They were but a few of the lucky ones. In general, the boys went off to attend to their various activities, some of them even completing enough events to earn their last few rockers. All told, it appears more than 80% of the boys have earned rockers in at least four or five of the six categories. Pretty good for having 3-4 walking wounded (only one earned this particular red badge of courage at camp – the rest brought their casts from home). Then an amazing story returns to camp. Remember those boys who decided to sleep in rather than wake up early to see Shaun White? They went to Camp Thunder (an automatic shotgun activity center). But there’s a delay there. They inquire why. It just so happens they’ve closed the center for 30 minutes to allow a celebrity to shoot. “Who’s this celebrity?” you’re all no doubt asking. Why, it’s that famous mountain boarder Shaun White. The staff asks the boys if they’d like a peek. The boys of course agree. Inside one of them (our SPL) shouts, “Hey, Shaun! Can I get your autograph?” Shaun looks up at the SPL, pauses, then goes to speak to his agent. He then approaches our boys and gives them autographs and they take close-up pictures. If the early bird always gets the worm, sometimes the late sleepers catch the fish. We’re scheduled to be packed and out of camp by 8:30am. There are, however, a lot of variables that may delay us by up to two hours. Keep your fingers crossed. One of the variables that seems to be falling into our favor is the evening’s weather. It’s predicted to be rainless, which allows us to pack the tents and sleep under the stars tonight. Last night’s clear skies provided the perfect venue for star gazing. I saw a meteor. It would be fun to lie down all night and watch the stars trek across the Virginia sky. I’m predicting, if that’s the case, the old astronomer in me will keep me awake all night. As the boys stretch breakdown far past our expected time schedule, my tent remains up. Seeing the sky cloud up, I’m having second thoughts about sleeping outside. First, there is always the issue of the rain, and there’s not enough room under the leader’s tent for all five of us. Second, having another five man tent gives us more dry space to store valuables. Finally, the tent could be used by anyone needing a place to dress in the morning. All around us, camps are breaking down. In fact, only two troops appear to be keeping their tents up. The hot sticky muggy shirtless (can I think of any more adjectives) summer night remind me of growing up in Buffalo. This is the kind of weather that brings back the pleasant memory of comfort and security. Not only did the humidity provide a blanket of comfort (unless you were foolish enough to wear a shirt), but, for some reason, the feeling evokes nearness of family and the emotional security that entails. As I look around our camp, I can’t help but think our troop has blossomed into a family of sorts. It’s like having not one, but thirty-two sons. I bet, to some extent, the boys think of themselves as brothers. As all the troops finish breaking down, we begin to see boys being boys – in a good way. In our troop, some play cards, some regale each other with tales of their Jamboree experience and others just sit and relax. The diversity of boys amazes me. It also makes me think I’ve seen one too many World War Two movies. With half the boys shirtless, it looks like some platoon stationed in the South Pacific the night before a big battle. The battle metaphor extends to the neighboring troop. What had once been “Niagara Street” – the road separate us from the Vermont troop, is now ablaze in what appear to be light sabers. The darkness masks the boys wielding these multi-colored swords, making is seem as if the sticks of blue, green and red are dancing my themselves as they float in the moist air. As things die down, most of our boys sleep barracks style under the canopies. We took the bottom half of the legs off the canopies to give them a lower profile. This’ll better protect the structure from sudden wind gusts and keep the boys drier if it rains. The Kactuz and Shark patrols flank the sides of their canopy with tarp. They call it a fort. Inside, things are cot-to-cot, so it looks like the boys are walking on a big trampoline. There’s a bit more room in the canopy shared by the Eagle and Skittle patrols. More of those boys have decided to create make-shift lean-to’s out of the extra tarps. Their inventiveness and fearlessness impresses me. Shortly after 9:00pm, the commissioner informs us radar has spotted some rain heading our way. It should hit us around 10:00pm. It may include thunder and lightning. I suspect this “thunderstorm warning” is just a ploy to get everyone in bed early and well battened down. When 10:00pm rolls around, everyone’s in bed. Nothing happens. Not even close. For a moment, the inefficiency of this strikes me. Wouldn’t it have been easier just to have packed up and left tonight? We’re pretty much ready to go. And by leaving tonight, we wouldn’t have to worry about any possibility of rain. Still, like the shakedown, the excitement of these unplanned camping experiences often provide the most memorable times. Doing something different, with just a pinch of the fear of the unknown, and, ultimately, surviving, instills a sense of confidence in one’s spirit. More so the younger you are. 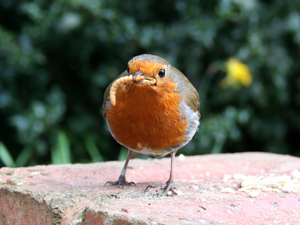 Stay Tuned for Tomorrow’s Exciting Journal Entry: Red Robin – YUM! You Maggots!